East London / Kentani / Port St John’s. With us, you can’t go wrong! The Greatest “Shoal” on Earth! 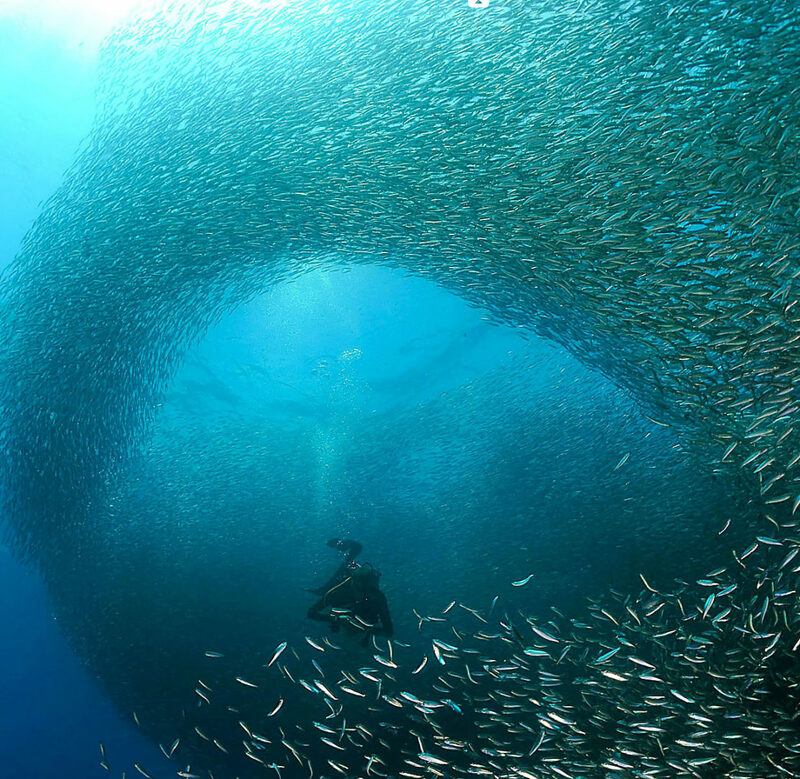 The Sardine Run happens every year. It is a massive, indescribable occurrence which takes over the eastern coast of Southern Africa. Billions of sardines spawn and begin to migrate which, as you can imagine, attracts a massive amount of oceanic predators. This feeding frenzy has been a tourist attraction of grand proportions and left many people in awe of the wonders of nature. We can enable you to witness the sardine run up-close-and-personal – Contact us today to enquire. Sardines group together when they are threatened. This instinctual behaviour is a defence mechanism, as lone individuals are more likely to be eaten than large groups. The sardine run is still poorly understood from an ecological point of view. There have been various hypotheses, sometimes contradictory, that try to explain why and how the run occurs. 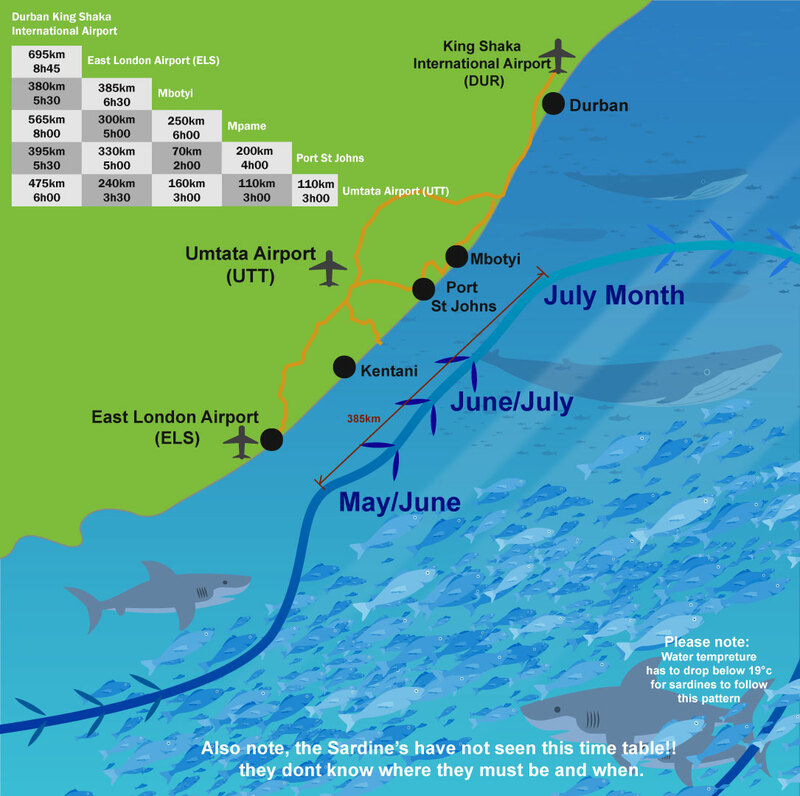 A recent interpretation of the causes is that the sardine run is most likely a seasonal reproductive migration of a genetically distinct subpopulation of sardine that moves along the coast from the eastern Agulhas Bank to the coast of KwaZulu-Natal in most years if not in every year. Book now for the 2019 Sardine Run! Starting Sun, June 02 2019 through to Wed July 30 2019. The migration is restricted to the inshore waters by the preference of sardine for cooler water and the strong and warm offshore Agulhas Current, which flows in the opposite direction to the migration, and is strongest just off the continental shelf. A band of cooler coastal water and the occurrence of Natal Pulses and break-away eddies make it possible for sardine shoals to overcome their habitat constraints. The importance of these enabling factors is greatest where the continental shelf is narrowest. The presence of eggs off the KwaZulu-Natal coast suggests that sardine stay there for several months and their return migration during late winter to spring is nearly always unnoticeable because it probably occurs at depths where the water is cooler than at the surface. In some years there does not appear to be a sardine run. This may be because it is not detected by coastal observers either because it actually does not occur due to high water temperatures and/or other hydrographic barriers, or the migration may occur farther offshore and possibly deeper due to unusual conditions. 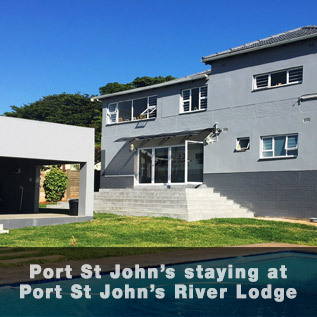 Thu, June 16 to Thu, June 23	 Port St John's staying at Port St John's River Lodge www.portstjohnsriverlodge.co.za	 1st night Umkomaas. 6-nights Port St John's. 5-sea days on the Sardine Run. Fri, June 21 to Fri, June 28. Port St John's staying at Port St John's River Lodge www.portstjohnsriverlodge.co.za	 1st night Umkomaas. 6-nights Port St John's. 5-sea days on the Sardine Run. Sat, June 22 to Sat, June 29. 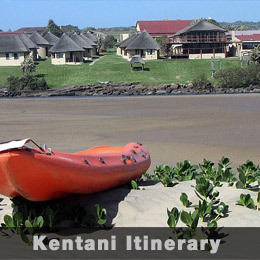 Kentani out of Wavecrest www.wavecrest.co.za	 6-sea days / 7- nights Fully inclusive. Sat, June 29 to Sat, July 06. 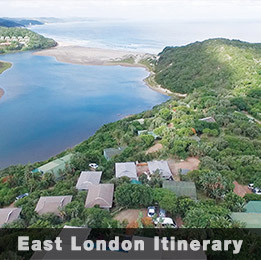 Kentani out of Wavecrest www.wavecrest.co.za	 6-sea days / 7- nights Fully inclusive. Thu, June 27 to Thu, July 04. Port St John's staying at Port St John's River Lodge www.portstjohnsriverlodge.co.za	 1st night Umkomaas. 6-nights Port St John's. 5-sea days on the Sardine Run. Tue July 02 to Tue July 09. Port St John's staying at Port St John's River Lodge www.portstjohnsriverlodge.co.za	 1st night Umkomaas. 6-nights Port St John's. 5-sea days on the Sardine Run. Sat July 06 to Sat July 13. Kentani out of Wavecrest www.wavecrest.co.za	 6-sea days / 7- nights Fully inclusive. Mon July 08 to Mon, July 15. Port St John's staying at Port St John's River Lodge www.portstjohnsriverlodge.co.za	 1st night Umkomaas. 6-nights Port St John's. 5-sea days on the Sardine Run. Sat July 13 to Sat, July 20. Port St John's staying at Port St John's River Lodge www.portstjohnsriverlodge.co.za	 1st night Umkomaas. 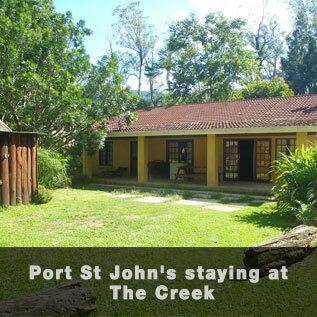 6-nights Port St John's. 5-sea days on the Sardine Run. Port St John’s only: Private charters available for a 10 night / 9 day Expedition @ ZAR 375 650 with a minimum of 5 divers to 8 divers maximum plus a guide. Port St John’s only: Private charters available for a 7 night / 6 day Expedition @ ZAR 270 000 with a minimum of 1 guest to 8 divers maximum plus a guide. Please be advised, all the above dates are “set in stone” and cannot be changed to suit individual requirements. All Expeditions out of East London are 7 night / 5 sea day / 1 reserve day Expeditions, starting and ending on the dates as advised in the table above. All Expeditions out of Kentani are 6 night / 5 sea day Expeditions, starting and ending on the dates as advised in the table above. All Expeditions out of Port St John’s are 10 night / 9 sea & 6 Nights / 5 Sea day Expeditions, starting and ending on the dates as advised in the table above. Sardine Run Expeditions out of Kentani can be tailored to fit in with your specific dates, if your dates of travel fall within the period, Sun June 02 – Sat July 30, 2019. They can be of a 1-day duration, not recommended, and for as long as you wish. Subject to availability. ZAR 4 650 per diver per day sharing. ZAR 5 050 single, per day. The Sardine Run Expedition is a unique wildlife encounter, following the annual Sardine migration along South Africa’s beautifully rugged coastline. Typically, the annual migration of the Sardines from their beginnings in the Southern Cape to being sighted off shore on South Africa’s Wild Coast starts in June each year. As the shoals of Sardines move northwards up the coast the size of the Sardines shoals tend to grow, ultimately forming the ‘greatest shoal on earth’. 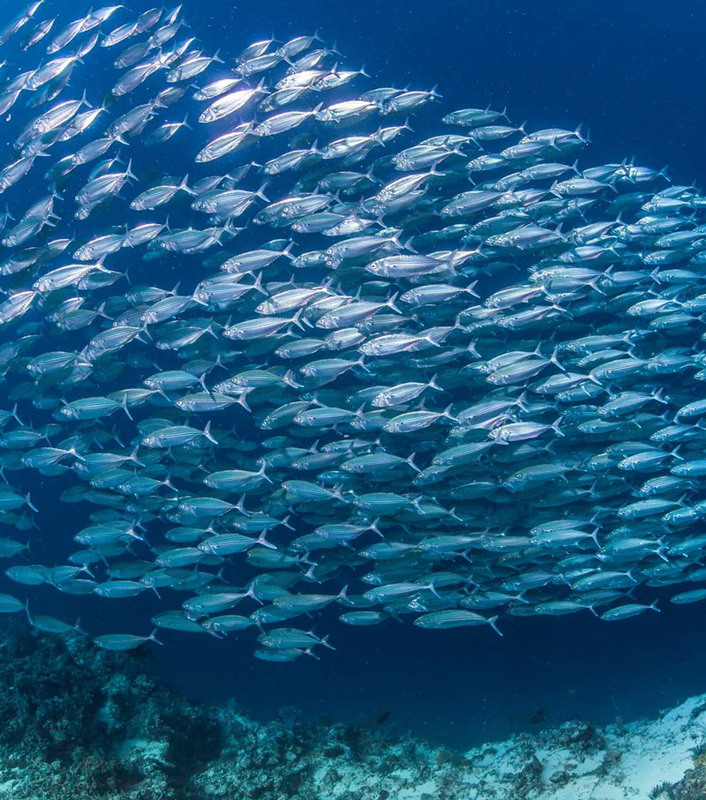 This amazing journey attracts a multitude of predators that track and follow the Sardines migration, exploiting this localized and abundant food source. It is hard to describe the excitement of the Dolphins, numerous bird species, Whales, Cape Fur Seals and Sharks as they ‘hunt’ the Sardines. You can actually hear the excited squeals of the thousands of Common and Bottlenose Dolphins as they travel in large breaching waves to pursue their prey, long before you see them. Attracted by the Sardines, game fish such as Shad and Garrick pursue the Sardine Shoals and provide another food source for the Dolphins. 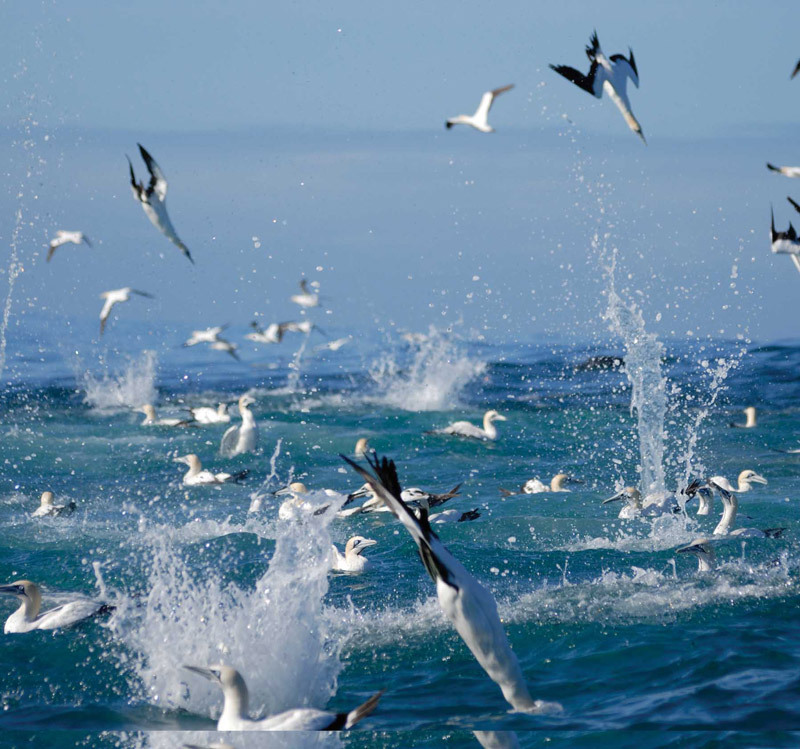 Contributing to the noise and surface action are the birds, Cape Gannets, Albatross (yellow nose and black-browed), Terns and Petrels, diving into the shoals of Sardines from a great height. Humpback Southern Right and Brydes Whales can also be seen in pursuit of this moving feast. Below the surface, the action continues with the Sharks (Copper, Dusky, Blacktip, Whitetip, Bronze Whalers and Zambezi) feasting on the Sardines and other marine life. The Cape Fur seals actually sleep with one eye open, ready to react should they see a large shark in their vicinity. 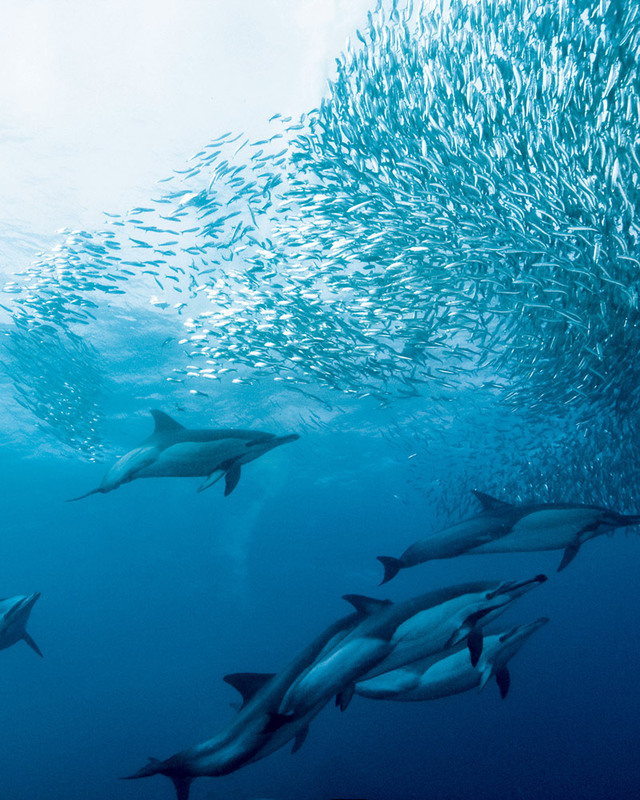 The Dolphins and Sharks look for opportunities to herd the Sardines into balls, this is the Sardines natural reaction to feeling threatened as they perceive there to be safety in numbers. These ‘bait balls’ vary in size and frequency, with the action on some of the larger ones lasting hours. After several weeks of migrating northwards, the sardines swim out to sea and are carried along the inner edge of the Agulhas current back to the southern Cape to spawn. It must be mentioned at this point that the Sardine Run is a natural phenomenon; therefore the exact timing cannot be predicted. Typically the best times to see the ‘run’ is June to July. We spot the shoals of sardines by the telltale signs of Dolphins splashing at the surface or by flocks of birds diving into the water. From Kentani we are also able to use the elevated hills to look for miles to see the activity. We position the boat slightly in front of the action so that by the time you have entered the water the marine activity has drifted to your position in the water. From our experience we would recommend that the majority of your time in the water be spent on snorkel as this will give you the speed and flexibility to enter and exit the water easily and therefore not miss out on the fast moving action. If we do encounter activity that is of sufficient size you will have the opportunity to enter the water on scuba. As the vast majority of your in water activity can be conducted with ease on snorkel this makes the Sardine Run an accessible and exciting marine expedition for non-divers and divers alike. As long as you are comfortable snorkeling you will not miss out on the action. This makes it a great adventure for the whole family. We use 8m RIBs that are nimble but robust enough to tackle the typical surf launches we have as a consequence of the structure of our coastlines. The boats are fitted with storage for cameras. We recommend that only camera equipment that has a waterproof housing or water resistant cover be used on the boat due to the open nature of the boat. The 2019 Dive The Big 5 Sardine Run Expedition will be run from a small fishing lodge (Bulls Inn) in the Eastern Cape at Kentani. This hidden gem in the heart of the Eastern Cape is about 10km south of the nearest town (Hole in The Wall) providing us unrivaled access to the local marine action, a short stroll from the lodge to the sea shore means easy access to the boat to start your day’s adventure. As we are based away from the main hubs for the Sardine Run(Port St John’s Mbotyi) we have a significantly increased chance of being the only boat in the area following the Sardines. Bulls Inn has a bar area with a large fire where you can unwind after your day at sea, with its deck looking straight down the bay to the ocean. All rooms are en-suite with family room options available. This lodge is rural and therefore cell phone signal is intermittent. However, the rustic nature of the lodge and its location add to the feeling of connection to nature and the sea, making it an ideal place to experience the Sardine run from – far from the madding crowds. You can’t help but sit back and feel relaxed. You don’t have to do the above full 5 day / 6 night expedition, you can choose the dates you want to start, the duration of the expedition, be it 01, 02, 03, 04 or more days at sea, or longer. You choose. The longer you spend on the Expedition, the better your chances of encountering Sardines. As I’m sure you know, the annual Sardine run is a phenomenon that usually happens any time between the last two weeks in May to the first two weeks in July, a “window” period of between 7 to 8 weeks. Just exactly when in that “window” nobody can say. For example, 2003 was the 3rd time in 23 years that the sardines failed to “run” at all. 2004 we had groups on site during the whole of June and there was a brief run during the first week of July – all our clients missed what they had specifically come to South Africa to witness!! In 2005 we had a good “run”. The first two weeks (end of May and beginning of June) were quiet but there after we had action almost every day. Lot’s of small bait-balls and plenty of dolphin activity with limited shark activity. But when there were sharks it was action, action and action with many of the divers changing their mind about getting into the same ocean as the sharks!! 2006 was again a “no show” – the 4th time in 26 years that the Sardines failed to make an appearance!! 2007 was almost the same as 2006, making it the 5th time that the Sardines failed to run!! 2008, 2009, 2010, 2011 and 2015 were good years, depending on where you were based. What’s going to happen in 2017 – no one can say!! The scientists say that in order for the sardines to run the water temperature has to drop to 21º C and lower, if that doesn’t happen the Sardines simply don’t run. So you can appreciate that the Sardine Run is very much a hit and miss affair. The professional photographers, Blue Planet, National Geographic, Discovery Channel etc. do not have the same time restraints nor budget restrains that the average “diver” has, therefore they spend the entire 8 weeks off the Transkei Coast between Port St Johns and East London waiting and hoping. For the average man in the street this is not possible which means that you must choose a 7 / 9 /11 day period during the last two weeks in May and the first two weeks in July and hope and pray that the Sardines will run during the time that you’ve selected. The other major consideration is where to be based if and when they do “run”? Historically, the Sardines appear between the town of Port Elizabeth to the south and Port St Johns in the north, they very rarely reach the KwaZulu/Natal south coast or Durban. A distance of about 1 000 kilometers and they could appear anywhere and at any time along this 1 000 kilometre coastline. Most of this coastline is inaccessible, especially that bit between East London and Port St Johns, so I’m afraid that it’s not a case of jumping into a car to follow the Sardines. You’ve actually got to be based at the right place and at the right time. As a result, Dive The Big 5 locate themselves in East London, Kentani, Port St John’s, or at Mbotyi, which historically, is right in the middle of where it is all likely to happen.